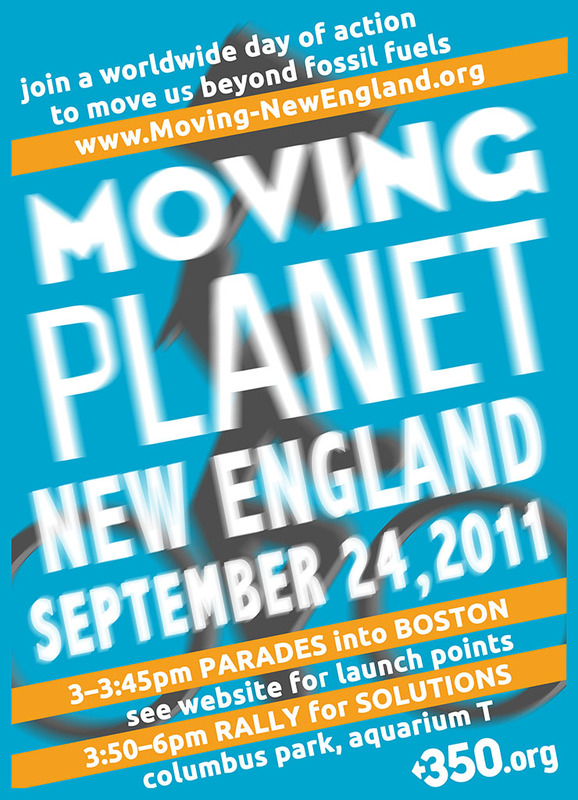 Just four days to the Moving Planet Rally! This Saturday, September 24th, hundreds of thousands of people across the globe will come together to move beyond fossil fuels and create a watershed moment in planetary history. Together, we will send a loud, clear and inspiring message: we are creating a healthy, just, and sustainable world for all, and expect our elected officials and corporate executives to do the same. Let's keep them accountable for moving us beyond fossil fuels! Planet Movers will fill roads, trains, and waterways by foot, bike, canoe, kayak, and ferry, T and commuter rail on their way to the Moving Planet: New England Rally. See the scores of participating groups here. Join Green Medford for this historic and world-changing event! We will meet at the West Medford Commuter Rail station. We're gathering starting about 1:00 pm (with free donuts from the remarkable Donuts with a Difference in Medford Square), and we will depart about 1:30 pm. We will be biking to Union Square to meet up with the group from Somerville Climate Action, so we can ride in to Boston together in one really big contingent! Please RSVP to Bruce Kulik if you want to join us for the ride or take the Commuter Rail (1:32 pm departure for North Station) and meet back up at North Station. We will meet the Somerville group at the triangle behind the fire station. From there they have a route through Sullivan Square, Charlestown, through the Navy Yard, across the locks, and through the North End to Columbus Park. You can see that here. Groups of 15-25 will parade from North Station to Christopher Columbus Park every few minutes. The rally will feature Sustainable Hip Hop artist Tem Blessed, Pedal-Powered Soul and Roll band Melodeego, Living on Earth's Steve Curwood, inspiring students from Boston Latin School's Youth Climate Action Network, updates on national and local Tar Sands Actions, and opportunities to connect with others! Good Post. The most reliable moving company should arrive on time. The delays can cause a lot of trouble. To avoid any hassle always choose the best Movers Boston. It’s good to know, that we have a choices about our moving needs. The wide variety of services is very fulfilling. We all have different needs on moving.